You know those times when you ate something and the memory of how good it tasted lingers on in your mind? I first had these shrimp at a potluck a few years ago, and at last have the recipe from my friend, Lisa, to share with you. “It’s so much better with fresh curry leaves,” both Lisa and the recipe proclaim. I tried it with large shrimp, medium shrimp; fresh curry leaves, fresh basil leaves; Thai green chillies, Serano chilies and red bell pepper. 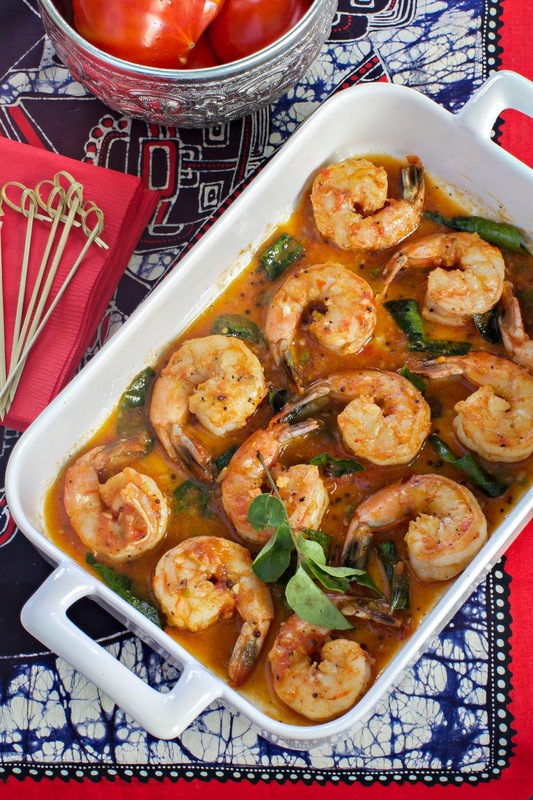 It was all good, but I’ll probably make the medium shrimp - with the Thai chilies and curry leaves - most often. *Note: cut a small piece from one side of the tomato and grate on a hand-held grater - measure the juice and seeds). 1. Wash the shrimp well. Let drain in a strainer, then fold shrimp in paper towels to completely dry them off. Put the shrimp in a bowl; add the cayenne, black pepper, salt and chilies. Mix well, and refrigerate until ready to stir fry. 2. Put the oil in a wok or large frying pan and set over medium-high heat. When the oil is hot, test one seed to see if it pops. Add the rest of the mustard seeds. As soon as they all pop (in a few seconds), remove from the heat and add the garlic. Cook the garlic through, but do not let it burn. Stir a few times. Return to the fire, and add the curry leaves so they release their oils - about 5 - 10 seconds. Then add the shrimp, and stir around for about 1 -2 minutes as they turn opaque. Add the grated tomato and stir to heat through. Taste for seasonings. Serve immediately. Medium shrimp serves 2-3. Leftovers can be put in fridge for a day or two. Recipe adapted from Madhur Jaffrey's book, At Home with Madhur Jaffrey.